Judith K. Valentine, 71, of Reading, passed away Thursday, September 13th, at Reading Hospital and Medical Center, West Reading. Judith was born in Pittsburgh, on February 1, 1947, a daughter of the late Evelyn Z. (Harmon) and Michael A. Waldschmidt. She was the wife of William L. Valentine. 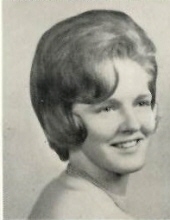 Mrs. Valentine graduated from North Hills High School, Pittsburgh in 1966. Judith loved her pets. She is a family member to the Waldschmidt family of Spring Garden Road, Pittsburgh. A viewing will be held from 10:30 AM to 12:00 PM on Tuesday, September 18th at the Sanders Funeral Home & Cremation Services Inc., 1501 North 11th Street, Reading, PA.
Interment at Berks County Memorial Gardens, Fleetwood, will occur at a later date. Online condolences may be made at, www.sandersfuneral.com. To send flowers or a remembrance gift to the family of Judith K. Valentine, please visit our Tribute Store. "Email Address" would like to share the life celebration of Judith K. Valentine. Click on the "link" to go to share a favorite memory or leave a condolence message for the family.